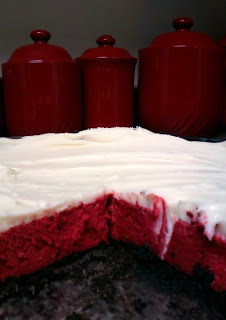 Flour Mayhem: Red Velvet Cheesecake! Oh yeah baby, that's the good stuff!!! Our anniversary was this past Sunday, so I wanted to make something amazing for the love of my life. Something different, something special, something RED! 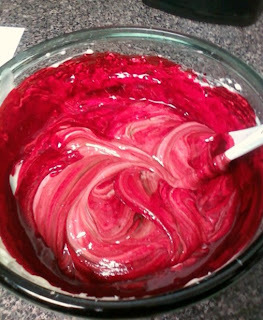 Jason loves my cream cheese frosting, so I knew whatever I did, it had to have that frosting. 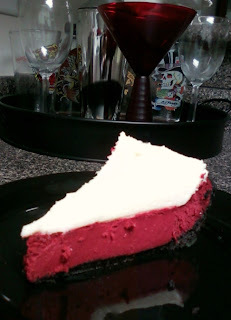 I looked and looked, finally found something that I really wanted to do - Red Velvet Cheesecake! Only one problem, I still can't find a dang spring form pan anywhere it seems, all I have is my trusting pie plates. All the recipes I found for that certain cheesecake you needed a spring form pan, water bath, etc, etc. Bad news for me right? NOPE! I have a recipe for a plain ol' German chocolate cheesecake with a chocolate crust, you just add melted German chocolate to the batter, and there ya go.. Well, I thought why not use a different kind of chocolate (semi sweet), add some red food coloring, and then top if off with the cream cheese frosting instead of the sour cream I usually use. SOUNDED GREAT!!! Jason has been my rock for as long as I can remember really. First as my friend, then eventually as the man I share my life with. 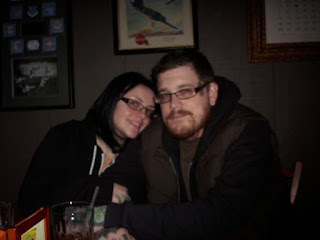 He is the most talented, funniest, smartest, handsomest man I know and I love him with everything I've got. I am so extremely grateful and proud to have him in my life. I'm proud of everything we've accomplished together, and I just want you to know baby, that I adore you with every inch of my soul, and love you more than I can ever describe! Awwwwwwww, okay enough of that mushy crap. Let's get back to the good stuff - CHEESECAKE!!!! It is so pretty once it's all put together and Jason actually said that the filling looked like play dough, which was kinda scary. At least it doesn't taste like play dough, so that's a plus! !